The use of SOPAT technology for research and development is documented in these scientific publications. Learn more about our method and process in our literature. Here you can find articles written by SOPAT employees and other researchers in reference to the implemented technology. All articles are freely accessible and can be acquired by you. Emmerich, J., Tang Q., Wang, Y., Neubauer, P., Junne, S. and Maaß, S.
Particles occur in almost all processes in chemical and life sciences. The particle size and shape influence the process performance and product quality, and in turn they are influenced by the flow behavior of the particles during production. Monitoring and controlling such characteristics in multiphase systems to obtain sufficient qualities will greatly facilitate the achievement of reproducible and defined distributions. So far, obtaining this information inline has been challenging, because existing instruments lack measurement precision, being unable to process overlapping signals from different particle phases in highly concentrated multiphase systems. However, recent advances in photo-optics made it possible to monitor such features (particle size distribution (PSD), aspect ratio and particle concentration) with advanced image analysis (IA) in real-time. New analysis workflows as well as single feature extractions from the images using multiple image analysis algorithms allowed the precise real-time measurements of size, shape and concentration of particle collectives even separated from each other in three phase systems. The performances, advantages and drawbacks with other non-photo-optical methods for assessing the particle size distribution are compared and discussed. Bliatsiou, C., Malik, A., Böhm, L. and Kraume, M.
Hydromechanical stress is a crucial parameter for a broad range of multiphase processes in the field of (bio)chemical engineering. The effect of impeller type and geometry on hydromechanical stress in stirred tanks is important. The present study aims at characterizing conventional and new impeller types in terms of particle stress. A two-phase liquid/liquid noncoalescing dispersion system is employed, and the drop breakage is monitored in-line in a stirred tank. The published effects of agitation on drop deformation are confirmed and expanded significantly for five modified new impeller types. Radial impellers are advantageous for applications where low shear conditions are desired. A modified propeller with a peripheral ring and the developed wave-ribbon impellers present remarkable results by producing significantly low and high hydromechanical stress, respectively. The results obtained are correlated in terms of mean and maximum energy dissipation rate, as well as circulation frequency in the impeller swept volume. Riegler, P., Chrusciel, T., Mayer, A., Doll, K. and Weuster-Botz, D.
A retrofit approach enables the non-invasive and reversible modification of a commercially available stirred-tank bioreactor into a gas-lift bioreactor within a few minutes. The gas-lift bioreactor configuration was characterised using a non-coalescent medium at working volume-specific volumetric gas flow rates of up to 20 L L-1 h-1, showing mean gas bubble diameters of up to 0.57 mm, volumetric power inputs of up to 23 W m-3, gas-liquid mass transfer coefficients of up to 153 h-1 (CO) and up to 122 h-1 (H2), mixing times (θ90) of down to 0.5 min and gas hold-ups of up to 1.2%. A comparison of autotrophic batch processes with Clostridium aceticum and Clostridium carboxidivorans in the stirred-tank (2.0 L) and the retrofitted gas-lift bioreactor (2.5 L) at identical operating conditions showed differences in the cell dry weight and product concentrations (acetate, ethanol, butyrate, 1-butanol, hexanoate, 1-hexanol) due to gas-liquid mass transfer limitations caused by the reduced power input in the gas-lift bioreactor. CO limitation was demonstrated by a myoglobin-protein assay for CO measurement in the liquid phase. The simple retrofitting of a stirred-tank bioreactor for gas-lift operation thus provided comparative data on process performances of acetogenic bacteria that convert synthesis gas in gas-lift and stirred-tank bioreactors on a lab-scale. Als ein wichtiges Teilgebiet der Verfahrenstechnik war die Extraktionstechnik auf der diesjährigen ACHEMA wieder mit zahlreichen Neuerungen und Innovation vertreten. Neben bekannten Firmen präsentierten auch Universitäten und Hochschulen ihre neuen Konzepte zur Stofftrennung. Eine Auswahl der gezeigten Innovationen wird hier vorgestellt. Stehl, D., Milojević, N., Stock, S., Schomäcker, R. and von Klitzing, R.
Hydrophilic silica nanoparticles (100 nm in length and of 20 nm diameter) and larger hollow Halloysite nanotubes (HNTs; 800 nm in length with an outer diameter of 50 nm and an inner diameter of 15 nm) are used to stabilize an oil-in-water emulsion. These particle-stabilized Pickering emulsions (PEs) are used for the hydroformylation of a long-chain olefin (1-dodecene). Rhodium (Rh) and the water-soluble ligand sulfonated 4,5-bis(diphenylphosphino)-9,9-dimethylxanthene are used as catalyst. The emulsions are prepared by sonication and Ultra-Turrax in a specially designed vessel to protect the catalyst from oxygenation and to control the temperature of each sample during the preparation process. The Rh catalyst shows interfacial active behavior and strongly influences the mean droplet size of the emulsions, stability, wettability, and energy of detachment. Further, the Rh catalyst stabilizes an emulsion even in the absence of particles. In a mixture of Rh catalyst and particles, both attach at the interface if the droplet size is in a magnitude of micrometers. These PEs show a monotonous droplet decrease with increasing particle concentration. It is shown that hydroformylation is possible in all emulsions stabilized by the Rh catalyst, silica nanoparticles, or HNTs. However, the conversions in the emulsions are different. The highest conversion is observed in silica-stabilized emulsions with above 40 wt % after a reaction time of only 5 h. Further, high selectivity for aldehyde was observed for all emulsions. A model for the behavior of the emulsions in the reactor is postulated. Interestingly, the emulsions stabilized by the Rh catalyst and silica nanoparticles are destroyed after the reaction, but the HNTs-stabilized PEs remained stable. Emmerich, J., Tang, Q., Wang, Y., Neubauer, P., Junne, S. and Maaß, S.
Pedraza‐de la Cuesta, S., Knopper, L., van der Wielen, L. A. M., and Cuellar, M. C.
Sesquiterpenes are a group of versatile, 15‐carbon molecules with applications ranging from fuels to fine chemicals and pharmaceuticals. When produced by microbial fermentation at laboratory scale, solvents are often employed for reducing product evaporation and enhancing recovery. However, it is not clear whether this approach constitutes a favorable techno‐economic alternative at production scale. In this study empirical correlations, mass transfer and process flow sheeting models were used to perform a techno‐economic assessment of solvent‐based processes at scales typical for flavors and fragrances (25 MT year−1) and the fuel market (25 000 MT year−1). Different solvent‐based process options were compared to the current state of the art, which employs surfactants for product recovery. The use of solvents did reduce the sesquiterpene evaporation rate during fermentation and improved product recovery but it resulted in costs that were higher than, or similar to, the base case due to the additional equipment cost for solvent‐product separation. However, when selecting solvents compatible with the final product formulation (e.g. in a kerosene enrichment process), unit costs as low as $0.7 kg−1 can be achieved while decreasing environmental impact. Hohl, L., Schulz, J. M. und Kraume, M.
Undesired foaming during high-speed filling of non-carbonated beverages is often observed in practice. To reduce foam formation, the filling dynamics must be adapted to the foaming capacity of the product which in turn reduces the output and economic efficiency of the filling line. The macroscopic stability of these undesired foams is determined by morphological properties of the foam, e.g. the bubble size distribution. At the same time, the entrainment and dispersion of the gas phase in the product is affected by the filling dynamics and the product’s material properties. The present contribution deals with the measurement of the morphology of foams arising during the bottling of fruit juices. For this, industrial bottling pro-cesses are reproduced in the lab and the forming foams are characterized in real-time with an inline measurement technique which yields 2D photo optical visuals. Automatic image analysis is applied to analyze the shape and size of foam bubbles and determine size distri-butions with respect to space and time. The results allow conclusions concerning the effect of the volume flow and product properties on the morphology of the foam and provide a basis for the development of actuators for the active control of foaming. McHardy, C., Rudolph, A., Panckow, R., Kostova, J., Wegener, M. and Rauh, C.
Castellano, S., Sheibat-Othman, N., Marchisio, D., Buffo, A. and Charton, S.
A zero-dimensional homogenous Population Balance Model (PBM) based on the evaluation of the volume-averaged coalescence and breakup rates is here adopted for the first time to fit the model parameter values through experiments carried out on a water-oil emulsion. The method accounts for the spatial inhomogeneities in mixing, namely for the probability density function of the turbulent kinetic energy dissipation in the apparatus, but avoids the use of coupling the PBM with computational fluid dynamics (CFD) or compartmentalization, thus ensuring fast computational time. In order to demonstrate the advantage of the proposed model over traditional ones based on the volume-averaged turbulent kinetic energy dissipation rate, the operating conditions were varied, including the mixing rate, the disperse phase fraction as well as considering inverse emulsions (water in oil and oil in water). The new model was found to be more generalizable to different operating conditions. Cell morphology is not only influenced by the cell cycle, the aging or individual properties, but also by environmental impacts such as those occurring on a large-scale. Cell morphology can be a suitable parameter for in situ measurements as it changes dynamically and is often related to cell physiology. In order to be able to identify relationships between cell physiology and morphology, statistically representative amounts of data have to be measured. It should be considered that the behaviour of cells is not only dynamic, but also very sensitive to environmental changes. Therefore, off line measurements may not be suitable for detecting small changes in the morphological properties. Sampling and sample preparation would conceal this, apart from an often insufficient number of data or an unreasonable amount of time and effort. Among the techniques that are able to capture the morphological characteristics of cells in real-time, automated imaging technologies are promising, because they provide additional information about cellular structures, shape and cell aggregation beyond size. Photo-optical in situ microscopy (ISM) and three-dimensional holographic microscopy (DHM) were used in this study to measure the morphological dynamics in eukaryotic cultures on a single-cell basis, using heterotrophic algae and yeast as examples. The intracellular concentration of the polyunsaturated fatty acid docosahexaenoic acid (DHA) in the heterotrophic algae Cryptecodinium cohnii was monitored. A second order correlation between the DHA content as measured off line chromatographically and the prediction using the average Sauter diameter was found. A different media composition did not only influence the cell size, but also the circularity and phase homogeneity of the algae cells. Consequently, different chloride ion substitutes were tested with respect to the cell growth and lipid accumulation in C. cohnii. Multi-compartment reactors were used to investigate the influence of gradients, as they occur in a large-scale, on the morphological heterogeneity in Saccharomyces cerevisiae cultures. Contrary to expectations, the sterol synthesis was positively influenced by oscillatory oxygen availability (ergosterol ester concentrations increased by 75 %), although microbial growth was decreased (the biomass concentration was reduced by 20 %). Budding of yeast was monitored in batch cultivation using ISM. A narrow size distribution was measured during the growth phase while the population homogeneity increased. If glucose was depleted, the percentage of non-budding cells remained almost constant due to a significant reduction in growth activity. The ratio of budding and total cells was successfully applied to differentiate between the different growth stages. The methods proved to be suitable for monitoring morphological properties over a relevant concentration range. Faster particle identification, including overlapping particles, and further investigations to better understand the relations between the shape and state of a cell will allow the technology to be used to control a variety of bioprocesses. Panckow, R. P., Röhm, P., Junne, S. und Kraume, M.
Der Einsatz von Single-Use-Bioreaktoren zum Erzielen hoher Ausbeuten in Zellkulturen gewinnt zunehmend an Bedeutung. Die für den schnellen Wärme- und Stoffaustausch nötigen Energieeinträge können die zelluläre Phase durch zu hohe Scherbeanspruchung schädigen. Zur Beschreibung dieser Beanspruchung wurde ein Flüssig/flüssig-Modellstoffsystem  in einem wellendurchmischten Single-Use-Bioreaktor der Fa. Celltainer Biotech BV eingesetzt. Dessen patentiertes Durchmischungskonzept basiert auf der Kombination einer rotatorischen mit einer translatorischen Bewegung. Die am Reaktor befestigte und kontinuierlich mitbewegte foto-optische Endoskopmesstechnik der Fa. SOPAT GmbH erfasst während des Prozesses 2D-Bilddaten und misst Größe und Form der fluiden Partikel durch automatische Bildanalyse  (Abb.). Die aufgezeichnete Zerstörungskinetik der dispersen Phase gibt Aufschluss über deren Beanspruchung. Die Erkenntnisse aus dem Modellstoffsystem über die Scherbeanspruchung dienen als Grundlage für den Bezug auf das reale System mit einer zellulären Phase. Die Vermessung der durch Oberflächenbegasung eingetragenen Luftbläschen dient neben kLa als Kennwert für die Beschreibung des Stoffübergangs zwischen flüssiger und gasförmiger Phase. S. Wollny, R. Sperling, Chem. Ing. Tech. 2007, 79 (3), 199 – 208. R. P. Panckow et al., Chem. Eng. Technol. 2015, 38 (11), 2011 – 2016. Heyse, A., Plikat, C., Grün, M., Delaval, S., Ansorge-Schumacher, M. and Drews, A. The technical application of biocatalysts is commonly realized in aqueous media limiting the range of reactants to hydrophilic compounds. The use of Pickering emulsions (PEs), where biocatalysts are immobilized in water droplets stabilized by nanoparticles and surrounded by solvent containing the substrates, presents an alternative for reactions involving hydrophobic reactants. While batch PE biocatalysis has been demonstrated for a variety of reactions and enzymes, no continuous process at industrially relevant residence times has been reported yet. Here, a continuous membrane reactor is proposed to retain the aqueous drops containing the enzymes in the reactor while the product containing permeate is continuously filtered through the membrane. To identify main influencing factors on membrane operation, the impact of enzyme properties and concentration of nanoparticles on drop size distribution (DSD) and filterability was investigated. It was found that enzyme properties have a strong impact on both DSD and filtration. With lipases, PEs showed an improved filterability and reproducibility. Higher particle concentrations lowered the flux through the membrane due to unbound particles forming the filter cake. Thus, particle concentration should be kept as low as possible. The concept was proven by a continuous lipase catalyzed transesterification with the enzyme remaining active in the PE. Grafschafter, A., Rudolstorfer, G. and Siebenhofer, M.
The Taylor‐Couette disc contactor (TCDC) uses the hydrodynamic advantages of the rotating disc contactor (RDC) and Taylor‐Couette reactor. Drop size distribution, dispersed phase holdup and residence time distribution (RTD) of the TCDC in 0.1 m and 0.3 m diameter scale were determined. A correlation for the prediction of the Sauer mean diameter was validated experimentally for 0.3‐m scale. Analysis of RTD suggests application of the tank‐in‐series model. The number of vessels in series rises with increasing hydraulic load and decrease with increasing rate of rotation. The axial dispersion coefficient was determined in order to evaluate backmixing. Malone, K., Pesch, S., Schlüter, M., and Krause, D.
To date, experimental investigations to determine the droplet size distribution (DSD) of subsea oil spills were mostly conducted at surface conditions, i.e. at atmospheric pressure, and with dead, i.e. purely liquid, oils. To investigate the influence of high hydrostatic pressure and of gases dissolved in the oil on the DSD, experiments with a downscaled blowout are conducted in a high-pressure autoclave at 150 bar hydrostatic pressure. Jets of “live”, i.e. methane-saturated, crude oil and n-decane are compared to jets of “dead” hydrocarbon liquids in artificial seawater. Experiments show that methane dissolved in the liquid oil increases the volume median droplet diameter significantly by up to 97%. These results are not in good accordance with state-of-the-art drop formation models, which are based on oil-only experiments at atmospheric pressure, and therefore show the need for a modification of such models which incorporates effects of hydrostatic pressure and dissolved gases for the modeling of deep-sea oil spills and blowouts. Marbà-Ardébol, M.-A., Emmerich, J., Muthig, M., Neubauer, P. and Junne, S.
Rohm, H., Böhme, B. and Skorka, J.
Comminution of the solid contents during chocolate manufacture is an important process that affects physical and sensory properties of the final product. In this study, size reduction was achieved either by multiple passages through a roller refiner, or by agitated ball milling. Particle analysis revealed that size distributions but also particle size geometry and surface is affected by refining intensity and refiner type. The current results demonstrate that it is especially refining intensity that can be used to target rheological properties of chocolate. Kacker, R., Maaß, S., Emmerich, J. und Kramer, H.
In this study, an in-situ imaging system has been analysed to characterize the crystal size, the shape and the number of particles during a continuous crystallization process in a COBC. Two image analysis approaches were examined for particle characterization in the suspension containing both small nuclei and larger grown crystals (non-spherical and irregular in shape). The pattern matching approach, in which the particles are approximated to be spherical, did result in an overestimation of the size. Alternatively, a segmentation based algorithm resulted in reliable crystal size and shape characteristics. The laser diffraction analysis in comparison to the image analysis overestimated the particle sizes due to the agglomeration of particles upon filtration and drying. The trend in the particle counts during the start of crystallization process, including nucleation, determined by the image analysis probe was comparable with the one measured by FBRM, highlighting the potential of in-situ imaging for process monitoring. Heyse, A., Plikat, C., Ansorge-Schumacher, M. and Drews, A.
Pickering emulsions are currently receiving increased attention as a promising alternative to dispersions or surfactant stabilized emulsions in two-phase biocatalysis. In order to design a continuous membrane reactor using water-in-oil Pickering emulsions for biocatalysis, knowledge on the filterability of the Pickering emulsion is required. This can be influenced by a number of factors, e.g. type and size of stabilizing nanoparticles, applied solvent, and used membrane. 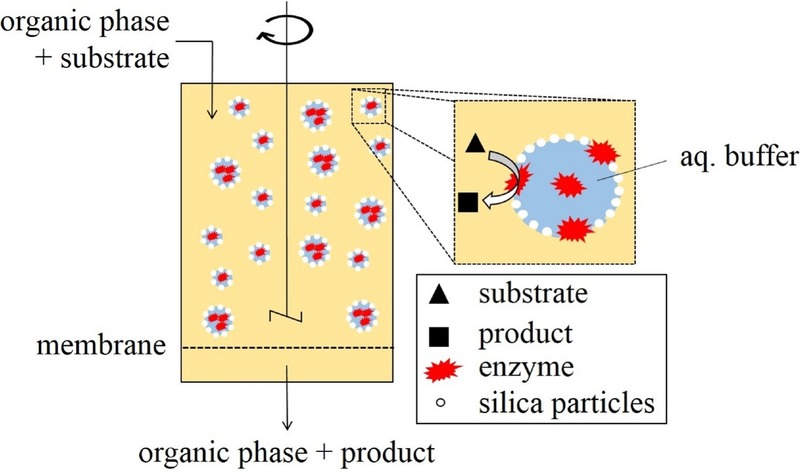 In a previous application of water-in-oil Pickering emulsions for continuous biocatalysis in a membrane reactor, spherical silica particles were used to stabilize the emulsion. This resulted in densely packed filter cakes due to unbound residual particles and decreasing flux over time. Furthermore, rather large droplet sizes with small specific interfacial areas were achieved. In this work, the use of colloidal silica nanoparticle for the stabilization of bioactive Pickering emulsions was studied. The filterability of bioactive water-in-oil Pickering emulsions stabilized by spherical or colloidal silica nanoparticles was compared. Using colloidal silica nanoparticles was found to result in smaller emulsion drop sizes, higher filterability and better reproducibility of drop size distribution and flux. An increase in water volume fraction decreased the flux level, but filtration was still possible at industrially relevant fluxes. With the selected nanoparticles, continuous biocatalysis in a membrane reactor at constant flux, i.e. constant residence time, was performed twice for 30 h. Substrate and product concentrations were constant and reproducible and the enzyme was still active after 30 h. The productivity was higher than that obtained with spherical silica nanoparticles and the process duration is the longest so far reported for continuous biocatalysis in PE at industrially relevant residence times. Hohl, L. and Kraume, M.
The phase behavior of microemulsion systems consisting of oil, water and non-ionic surfactants can lead to emulsions with unique properties: by adjusting temperature and composition a system with three liquid phases is obtained. These systems can be used as solvent systems for reactions such as the hydroformylation of long-chained olefins. Knowledge of the occurring dispersion and coalescence processes is crucial for process optimization and control. Using an endoscope measurement technique in a stirred tank, relevant criteria that determine the formation of complex droplets by the two dispersed phases such as multiple emulsions are defined. The influence of the third phase on dispersion and coalescence is discussed by analyzing the drop sizes of the dispersed phases in agitated systems in situ. Furthermore, the impact of the third liquid phase on the slope of sedimentation and coalescence curves is analyzed in subsequent phase separation experiments. Petzold, M., Röhl, S., Hohl, L., Stehl, D., Lehmann, M., von Klitzing, R. and Kraume, M.
Mass transfer in stirred liquid-liquid systems with and without silica nanoparticles is investigated for the saponification of benzoyl chloride. The mass transfer area is positively affected by the nanoparticles which lead to an increase of the liquid-liquid interfacial area due to droplet coalescence hindrance. However, an additional mass transfer resistance induced by particles at the liquid-liquid interface was observed for all particle concentrations, since the high occupancy diminishes the available area for mass transfer. The ratio of the two oppositional effects needs to be determined to identify suitable nanoparticle reaction systems. Hohl, L., Knossalla, M. and Kraume, M.
The phase separation of liquid/liquid systems consisting of oil, water and amphiphilic molecules is a function of temperature and composition. 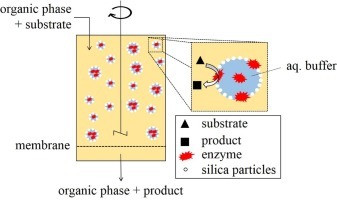 The phase separation is fastest in liquid three phase systems, where the organic and aqueous excess phases are separated by a microemulsion middle phase. In this work, a detailed analysis of the relevant physical properties (density, rheology, interfacial tension) of the phases in combination with drop size distribution measurements and image analysis of the droplet interactions is performed using an endoscope measurement system. This methodology enables to directly quantify influencing effects of droplet size and droplet interactions on dispersion and phase separation processes. The duration and character of the separation process strongly depends on the droplet interactions (e.g. formation of multiple emulsions) of the dispersed phases. Schmidt, M., Pogrzeba, T., Hohl, L., Weber, A., Kielholz, A., Kraume, M. and Schomäcker, R.
The palladium catalyzed methoxycarbonylation of long-chain olefin 1‐dodecene in a liquid/liquid biphasic system composed of methanol as polar phase and the substrate/product as nonpolar phase is reported. The immobilization of the palladium based catalyst in the methanol phase is affected by the use of the watersoluble ligand SulfoXantPhos and methanesulfonic acid as co‐catalyst. We investigated these systems with respect to reaction performance and catalyst recycling by variation of the type and amount of co-solvent in both existing phases. By modifying these systems with a co-solvent, catalyst recycling could be improved compared to the benchmark system without co-solvents to a palladium and phosphorous leaching <1 ppm. The applied homogeneously dissolved palladium catalyst could be quantitatively recycled four times via a simple phase separation without any loss in activity and selectivity. Cocke, J. and Maaß, S.
Recent studies have revealed unexpected developments in drop size by only small changes in the geometrical constraints of batch vessels used for suspension polymerization. The effect of the dispersed phase fraction, surfactant concentration, as well as baffle length on the evolving drop size distribution in different low viscous liquid–liquid systems is investigated. The analysis is focused on the drop-dominated systems by hindering the coalescence by polyvinyl alcohol (PVA) concentrations up to three times higher than the critical micelle concentration. The influence of PVA on drop size in breakage-dominated systems is well reproduced with population balance equation simulations. The Drops are measured using a photo-optical system with automated image analysis. The measured drop sizes increase with increasing dispersed phase fraction. As coalescence is completely hindered, all observed coalescence effects are connected to phase inversion, a catastrophic phenomenon during suspension polymerization for industrial production processes. Phase inversion can be reproduced for all studied solvents with and without the use of surfactants. In particular, the influence of the baffles can be reproduced. The system is adapted and trained to detect phase inversion as a warning system to make the suspension polymerization process more stable and robust. Panckow, R. P., Reinecke, L., Cuellar, M. C. and Maaß, S.
The exact knowledge of Drop Size Distributions (DSD) plays a major role in various fields of applications to control and optimise processes as well as reduce waste. In the microbial production of advanced biofuels, oil droplets are produced under turbulent conditions in an aqueous medium containing many surface active components, which might hinder the recovery of the product. Knowledge of DSD is thus essential for process optimisation. This study demonstrates the capability of a photo-optical measurement method for DSD measurement in fermentation broth and in plate separators aimed at cost reduction in the microbial production of advanced biofuels. Measurements were made with model mixtures in a bioreactor, and at the inlet and outlet of a plate separator. In the bioreactor, the method was effective in detecting a broad range of droplet sizes and in differentiating other disperse components (e.g. microbial cells and gas bubbles). In the plate separator, the method was effective in determining the influence of the varied parameters on the separation Efficiency. Solvent extraction is one of the main separation techniques and has been developed for a wide range of industrial applications. Ionic liquids (ILs) are often considered as environmentally friendly solvents and have been studied widely in various laboratory applications. Aiming to design effective extraction processes, in this work ILs have been employed for fractionation of pyrolysis oil, for demulsifying oil-in-water emulsions to recover surfactant, and for the design of a novel smart separation process type: fixed liquid extraction. Pyrolysis oil, the liquid product of fast pyrolysis of lignocellulosic biomass, is a complex mixture containing hundreds of components. For the valorization of pyrolysis oil, value-added chemicals are required to be separated. A study on aromatics removal from pyrolytic sugar streams was described in chapter 2 and 3, and a study on fractionation of oxygenates (acetic acid, glycolaldehyde and acetol) from pyrolysis oil cuts in chapter 4. In chemical enhanced oil recovery (CEOR), surfactant together with alkali and polymer are injected in the reservoir to enhance oil recovery yield. The surfactant is usually blended with water and oil in stable emulsions. Therefore, the first step for surfactant recovery is to destabilize these oil emulsions which is called demulsification. In chapter 5, in total 13 ILs were evaluated as demulsifiers for a model oil-in-water emulsion, and the efficiency and mechanism of demulsification were discussed. Application of ILs at industrial scale is restricted by their major drawbacks, such as high viscosity and corrosivity. IL-based emulsion systems that make use of stabilizers can potentially overcome these drawbacks. In chapter 6 the formation of several IL-based emulsions stabilized by microgel particles was studied, including the parametric influences on the drop size distributions. The influence of microgel particles on the extraction capacity and kinetics were investigated as well. In chapter 7, a novel separation process concept was explored for the processes, referred to as fixed liquid extraction, aiming for the design of separation process for extremely small S/F. ILs can effectively remove aromatics from pyrolytic sugar streams. Value-added oxygenates can be fractionated by a two-step extraction process. The studied halogenide ILs and P666,14[N(CN)2] can demulsify heptane-in-water emulsions and the mechanism of demulsification is anion exchange. Several IL-based emulsions stabilized by microgel particles has been prepared, and the concept of fixed liquid extraction has been demonstrated for the first time. Grafschafter, A. and Siebenhofer, M.
The Taylor-Couette disc contactor (TCDC) is a stirred liquid-liquid phase contactor which is suitable for applications in bioseparations. For liquid-liquid reactor design, information about the specific mass transfer area is inevitable. Therefore, the drop size distribution and holdup in the TCDC were investigated under various operating conditions and appropriate correlations for the prediction of these parameters have been determined. Experimental data of drop size distributions were correlated with lognormal, Gaussian, and Weibull drop size distribution functions. Skale, T., Hohl, L., Kraume, M. and Drews, A. This study shows the possibility of separating w/o Pickering emulsions (PE) via ultrafiltration and consequently enables a continuous process concept for catalysed L/L reactions in Pickering emulsions which are currently receiving increased attention. In two types of filtration experiments, the stability of PE against coalescence caused by the applied filtration pressure and stirring was shown. The PE could be concentrated up to 80% water phase fraction. In pressure stepping experiments, permeabilities between 3 and 10 L/(m2 h bar) could be achieved depending on the drop size distribution of the PE. For the used 1 kDa PVDF membrane, an unexpected overproportional behaviour of the fluxes at higher pressures was observed. The presented results show that Pickering emulsions can be regarded as a promising alternative to conventional dispersions also in continuous L/L catalysis. Marbà-Ardébol, A.-M., Emmerich, J., Neubauer, P. and Junne, S.
To date, on line monitoring in bioprocesses is restricted to conventional parameters. Presently, advances in microscopy allow the monitoring of single-cell size distributions in a bypass or in situ. These data provide information regarding population heterogeneity, substrate conversion, or product synthesis as these parameters are related to the size of the cells. In this study, changes in the single-cell size distribution of the heterotrophic microalgae Crypthecodinium cohnii were tracked with holographic microscopy and a photo-optical microscopy probe, which is applicable in situ. This algae produces the polyunsaturated fatty acid docosahexaenoic acid (DHA). On the basis of the cell size and broadness of the size distribution, the applied methods enabled to distinguish between cells in the growth and production phase. Under conditions of low growth and high fatty acid accumulation, the cell size kept concomitantly changing. The correlation between cell size measurements and the intracellular DHA content was confirmed by regression analysis. The phase heterogeneity, which was measured by holographic microscopy, changed simultaneously with the DHA synthesis. The amount of information obtained by both digital holographic and in situ microscopy is similar to that obtained by flow cytometry but with reduced effort for a real-time Analysis. Pogrzeba, T., Schmidt, M., Hohl, L., Weber, A., Buchner, G., Schulz, J., Schwarze, M., Kraume, M. and Schomäcker, R.
The first applications of aqueous surfactant-free multiphase emulsions as reaction media for rhodium-catalyzed hydroformylation of 1-dodecene and Suzuki coupling reaction of 1-chloro-2-nitrobenzene and 4-chlorobenzeneboronic acid are herein reported. The reaction systems were formulated from oil (reactant and solvent), aqueous catalyst solution, and diethylene glycol butyl ether [C4H9(C2H4O)2OH]. We investigated these multiphase systems with respect to reaction engineering and catalyst recycling to evaluate their application potential for new chemical processes based on switchable solvents. For the hydroformylation, conversion of 23.4% after 4 h reaction time could be achieved at mild reactions conditions of 95 °C and 15 bar syngas pressure. The applied Rhodium-SulfoXantPhos catalyst could be successfully recycled for four times, maintaining its very high linear-to-branched selectivity of 99:1. For the Suzuki coupling reaction yields up to 90% were achieved within a single run. The Pd/SPhos catalyst could be recycled three times, but activity decreased at almost stable selectivity due to higher ligand leaching during the separation steps. Stehl, D., Hohl, L., Schmidt, M., Hübner, J., Lehmann, M., Kraume, M., Schomäcker, R. and von Klitzing, R.
Emulsions stabilized by solid particles are so called Pickering emulsions which are characterized by their high stability against coalescence. This type of emulsion can be used for a lot of applications. Very little is known about how reaction conditions affect their properties. In this study the influence of important reaction conditions like shear stress, pressure, temperature, and the influence of synthesis gas on Pickering emulsions is investigated. It is shown that the emulsions remain stable in terms of coalescence in a broad range of the reaction conditions and are suitable as reaction media for industrial processes and for a reaction optimization with a subsequent separation step. Heeres, A. S., Heijnen, J., van der Wielen, L. A. M. and Cuellar, M. C.
In the search for advanced biofuels, microorganisms have been developed that make and secrete long chain hydrocarbons, resulting in a four phase fermentation mixture (cells, aqueous liquid, organic product, and (produced) gas). The product immiscibility offers the potential for a straightforward recovery, but surface active components in the fermentation broth emulsify the product droplets. In the current process, multiple centrifugation steps with chemical de-emulsifiers are used for product recovery, posing economic and environmental burdens on the process. In this paper, an alternative separation method is presented, in which gas bubbles induce coalescence of the emulsified oil droplets, obtaining a continuous oil layer. The oil layer formation was influenced by the gas flow rate, nozzle diameter, column geometry, and emulsion properties, offering the possibility for process optimisation. The developed gas bubble induced oil recovery method does not require chemical additives, uses mild process conditions, and can potentially be integrated with the fermentation, giving a low cost alternative for the conventional recovery method. Using this technology, another step can be made towards economically feasible production of advanced biofuels. Hohl, L., Schulz, J., Paul, N. and Kraume, M.
Tunable multiphase systems can be applied for the hydroformylation of long-chained olefins. These reaction systems enable highest yields and fastest separation processes under three phase operating conditions. However, little is known about the characteristic properties of these complex dispersions. In this study, a simplified model system consisting of water, 1-dodecene and a solvo-surfactant was analysed. The minimum aggregation concentration, interfacial tension, density and viscosity were determined. Additionally, the phase behaviour was investigated using conductivity measurements. The phase volume fractions under three phase conditions were analysed. An endoscope measurement technique was applied to determine the dispersion conditions and drop size distributions in a stirred tank as a function of composition and stirrer speed. Fries, T., Dittler, I., Blaschczok, K. , Löffelholz, C., Dornfeld, W., Schön, R., Drews, A. and Eibl, D.
Zur Quantifizierung der Beanspruchung durch die Zentrifugalpumpe PuraLev® 200SU wurde der mittlere Sauter-Durchmesser des Modellsystems Emulsion in Abhängigkeit des massenspezifischen Leistungseintrages ermittelt. Anschließend wurde mit ausgewählten Parametern die Absterberate von CHO-Zellen untersucht und mit den Ergebnissen der Emulsionsversuche verglichen. Es konnte gezeigt werden, dass für das biologische System neben dem Leistungseintrag weitere Parameter wie die Impellerumfangsgeschwindigkeit Einfluss auf die Partikelbeanspruchung haben. Amokrane, A., Maaß, S., Lamadie, F., Puel, F. and Charton, S.
The pulsed column is one of the most used contactors in solvent extraction processes, especially in the nuclear fuel treatment industry and for hydrometallurgical applications. The optimisation of solvent extraction operations needs a thorough understanding of the diphasic flow’s properties inside the apparatus, especially that of the dispersed phase. For the first time, in-situ measurements of the drop size distribution (DSD) were achieved in a small diameter pulsed column (lab scale), by using the SOPAT-VF light reflectance video probe on two water-in-oil (W/O) systems exhibiting low and high viscosities of the oil phase. Separate effects of the pulse amplitude and frequency on the DSD and the phase hold-up were evidenced for both O/W systems, despite their different viscosity levels. This technique allowed very precise measurements of droplet-diameters in quite a confined space, three orders of magnitude, which is remarkable. Experimental findings allowed the validation of a computational fluid dynamics (CFD)–population balance equation (PBE) coupled model and the improvement of breakage and coalescence kernel parameters. Rupture and coalescence mechanisms were correctly captured. The dependence of emulsion’s properties on the column hydrodynamics could then be illustrated over one period of the pulsed flow. Incidence of higher levels of pulsation intensity, hardly achievable experimentally, and separate investigation of the effects of viscosity and surface tension are presented. Hohl, L., Paul, N., and Kraume, M.
Micellar multiphase systems can be applied to enable reactions like the hydroformylation of long-chained olefins. These liquid/liquid systems combine advantages of homogenous catalysis like high and specific yield or mild reaction conditions with a fast phase separation process. In previous studies highest yields were observed in systems under three phase operation conditions whereby the reaction rate was a function of stirrer speed. Hence, dispersion conditions and drop size distributions need to be taken into consideration. In this study, micellar three phase systems were analysed using an endoscope measurement technique and image analysis in a stirred tank. A methodical approach to identify the respective phases and to clarify the dispersion conditions was found. The mean Sauter diameters were quantified as a function of the system composition. By applying abrupt changes of the stirrer frequency, the dynamic behaviour and coalescence effects were investigated. Aksamija, E., Weinländer, C., Sarzio, R. and Siebenhofer, M.
In the present project, the design of the Rotating Disc Contactor (RDC) has been fundamentally simplified and optimized in terms of separation efficiency, load capacity, and suitability for downstream processing of bio-based materials. Optimized performance was obtained when the stator discs were abandoned and their function was adopted by enlarged rotor discs. Mass transfer experiments showed improved separation efficiency in the novel apparatus, while the operating range was simultaneously increased. Due to recurring drop formation and re-coalescence in every compartment, large droplets were not observed, resulting in a narrower drop size distribution compared to the RDC. Panckow, R., Comandè, G., Maaß, S. and Kraume, M.
The presented results are obtained by means of an automated image analysis software capable of measuring particle diameters in photographs taken in situ by a 2D photo-optical measurement device. Initially, the applicability of this measurement method must be proven for fluid particle systems on the basis of spherical-shaped particles. As a first approach in targeting the issue of irregularly shaped fluid particles, a pure gas-liquid system is analyzed to investigate the influence of the variation of operating parameters. In the second step, the spherical shape is changed by reducing the surface-active auxiliaries. The usage of shape factors helps to interpret the appearance of the 2D projected objects. By examining the capabilities and limitations, it is demonstrated that the size of fluid particles can be detected online and in situ in order to analyze and control the particular chemical process. Dittler, I., Dornfeld, W., Schöb, R., Cocke, J., Rojahn, J., Kraume, M. and Eibl, D.
Pumps are mainly used when transferring sterile culture broths in biopharmaceutical and biotechnological production processes. However, during the pumping process shear forces occur which can lead to qualitative and/or quantitative product loss. To calculate the mechanical stress with limited experimental expense, an oil-water emulsion system was used, whose suitability was demonstrated for drop size detections in bioreactors1. As drop breakup of the oil-water emulsion system is a function of mechanical stress, drop sizes need to be counted over the experimental time of shear stress investigations. In previous studies, the inline endoscopy has been shown to be an accurate and reliable measurement technique for drop size detections in liquid/liquid dispersions. The aim of this protocol is to show the suitability of the inline endoscopy technique for drop size measurements in pumping processes. In order to express the drop size, the Sauter mean diameter d32was used as the representative diameter of drops in the oil-water emulsion. The results showed low variation in the Sauter mean diameters, which were quantified by standard deviations of below 15%, indicating the reliability of the measurement technique. Heeres, A., Schroën, K., Heijnen, J., van der Wielen, L. and Cuellar, M.
Developments in synthetic biology enabled the microbial production of long chain hydrocarbons, which can be used as advanced biofuels in aviation or transportation. Currently, these fuels are not economically competitive due to their production costs. The current process offers room for improvement: by utilizing lignocellulosic feedstock, increasing microbial yields, and using cheaper process technology. Gravity separation is an example of the latter, for which droplet growth by coalescence is crucial. The aim of this study was to study the effect of fermentation broth components on droplet coalescence. Droplet coalescence was measured using two setups: a microfluidic chip and regular laboratory scale stirred vessel (2 L). Some fermentation broth components had a large impact on droplet coalescence. Especially components present in hydrolysed cellulosic biomass and mannoproteins from the yeast cell wall retard coalescence. To achieve a technically feasible gravity separation that can be integrated with the fermentation, the negative effects of these components on coalescence should be minimized. This could be achieved by redesign of the fermentation medium or adjusting the fermentation conditions, aiming to minimize the release of surface active components by the microorganisms. This way, another step can be made towards economically feasible advanced biofuel production. In the present work the design of the RDC extractor, a well-established apparatus in solvent extraction, has been fundamentally simplified and optimized in terms of separation efficiency, load capacity and applicability for extraction of bio-based raw materials. Based on the Rotating Disc Contactor (RDC), a novel design of internals was discovered in the interaction of CFD simulation with Ansys Fluent and experimental validation (Particle Image Velocimetry, DSD measurements, sedimentation, tracer, load and mass transfer experiments). Being a hydrodynamic hybrid of a RDC and a Taylor-Couette reactor, the novel apparatus, therefore named TCDC, promises a wide range of applicability apart from solvent extraction. Experimentally validated simulation series show optimized hydrodynamic operating parameters (axial mixing, drop size distribution, vorticity, etc.) when the stator rings are abandoned and their function is adopted by rotor disks with increased diameter. Mass transfer experiments showed improved separation efficiency over the RDC, the HTU-value was decreased by ~ 35% while the operating/flooding limits were simultaneously increased. The elimination of the stator rings simplifies manufacturing and operation as well as cleaning and maintenance. Empirical design rules from literature, still state-of-the-art for the geometric design of RDCs, have been updated, simplified and theoretically consolidated. Dittler, I., Kaiser, S., Blaschczok, K., Löffelholz, C., Bösch, P., Dornfeld, W., Schöb, R., Rojahn, J., Kraume, M. and Eibl, D.
The suitability of oil–water emulsions to predict shear forces in stirred bioreactors under cost-effective and time-saving conditions has been demonstrated several times, but no application to pumps has been described so far. In this report, the drop sizes in a model oil–water system were determined for the Levitronix PuraLev® multiuse (MU) series (PuraLev® 200MU and PuraLev® 600MU), a peristaltic pump (Masterflex® I/P Easy Load), and 4-piston diaphragm pump (Quattroflow 1200-SU, where SU is single-use) using inline endoscopy. It was determined that the Sauter mean diameter could be used as a comparison criterion to estimate mechanical stress in pumps. The investigation showed that PuraLev® MU pumps are characterized by up to 59% larger Sauter mean diameters than their counterparts at comparable operational conditions. This indicates lower hydrodynamic stress in the PuraLev® MU pumps. Using computational fluid dynamics, a well-streamlined fluid flow and low turbulent energy dissipation rates were found in the PuraLev® MU pumps, which correlated well with experimental results. A calculation model was used to predict the Sauter mean diameter by combining both experimental and computational fluid dynamics data. Good agreement with deviations below 13% was determined between model predictions and experimental data. Gas-liquid-liquid systems, in which a gas is absorbed into an oil-water emulsion with or without chemical reaction, are of scientific, technical and commercial importance due to their wide industrial application. Through the development of the aqueous biphasic technique in homogeneous catalysis, gasliquid-liquid systems have gained increasing attention in various chemical processes, e.g. hydroformylation, carbonylation, hydrogenation and oligomerization (Cornils, 1999). This aqueous biphasic technique involves using water-soluble ligands to solubilize the metal complex catalyst in an aqueous phase, which is easily separated from reactants and reaction products by decantation. Hydroformylation of propene to n-butyraldehyde is a typical example for important industrial applications of gas-liquid-liquid reaction systems. In this process, the reactive gas mixture of carbon monoxide, hydrogen and propylene is converted to n-butyraldehyde in an aqueous solution of rhodium catalyst (Cents et al., 2004). Three different phases therefore exist in the reactor: the gas phase containing CO, H2, and propylene; the aqueous catalyst phase (water phase); and the dispersed organic butyraldehyde phase (oil phase). Panckow, R., Maaß, S., Emmerich, J. and Kraume, M.
Die exakte Bestimmung der Phasengrenzfläche in Gas/flüssig-Systemen ist unabdingbar für die optimierte Prozessführung verfahrenstechnischer Anlagen. Die experimentelle Studie zeigt Untersuchungen an einem Luft/Wasser-System mittels dreier Messtechniken hinsichtlich der Bestimmung der Veränderung der Blasengröße in Abhängigkeit von der Rührerdrehfrequenz. Die äußerst präzise und selbstreferenzielle Methode der foto-optischen Analyse wird bzgl. der Bildverarbeitung näher betrachtet. Es wird gezeigt, dass die neuesten Entwicklungen im Bereich der Foto-Optik und der Bildverarbeitung wertvolle Grundlagen zur Etablierung einer präzisen Echtzeitgrößenmesstechnik geliefert haben. Dies ist notwendig, da laserbasierte Methoden nur unzureichende Prozessdaten liefern. Schilder, L., Maaß, S. and Jess, A. The kinetics of the IL-catalyzed reaction of isobutane with 2-butene and the size distribution of the dispersed IL droplets were investigated in a stirred tank reactor. The results were used to calculate the intrinsic reaction rate constant with a model accounting for the interplay of external and internal mass transport and chemical reaction. The intrinsic reaction rate was found to be very high, leading to a low effectiveness factor of the IL catalyst. The used fraction of the IL droplets with a diameter of about 400 μm was very small, and the actual reaction took place only in a thin spherical shell with a thickness of about 5 μm. Emmerich, J., Maaß, S., Rojahn, J., Kraume, M. and Neubauer, P.
No abstract is available for this article. Full article available under this link. Ngo, T. H. and Schumpe, A.
Absorption of pure oxygen into aqueous emulsions of n-heptane, n-dodecane, and n-hexadecane, respectively, has been studied at 0 to 100% oil volume fraction in a stirred tank at the stirring speed of 1000 min−1. The volumetric mass transfer coefficient, , was evaluated from the pressure decrease under isochoric and isothermal (298.2 K) conditions. The O/W emulsions of both n-dodecane and n-hexadecane show a maximum at 1-2% oil fraction as reported in several previous studies. Much stronger effects never reported before were observed at high oil fractions. Particularly, all n-heptane emulsions showed higher mass-transfer coefficients than both of the pure phases. The increase is by upto a factor of 38 as compared to pure water at 50% n-heptane. The effect is tentatively interpreted by oil spreading on the bubble surface enabled by a high spreading coefficient. In W/O emulsions of n-heptane and n-dodecane increases with the dispersed water volume fraction; the reason for this surprising trend is not clear. Maaß, S., Rojahn, J., Hänsch, R. and Kraume, M.
Image analysis has become a powerful tool for the work with particulate systems, occurring in chemical engineering. A major challenge is still the excessive manual work load which comes with such applications. Additionally manual quantification also generates bias by different observers, as shown in this study. Therefore a full automation of those systems is desirable. A MATLAB® based image recognition algorithm has been implemented to automatically count and measure particles in multiphase systems. A given image series is pre-filtered to minimize misleading information. The subsequent particle recognition consists of three steps: pattern recognition by correlating the pre-filtered images with search patterns, pre-selection of plausible drops and the classification of these plausible drops by examining corresponding edges individually. The software employs a normalized cross correlation procedure algorithm. The program has reached hit rates of 95% with an error quotient under 1% and a detection rate of 250 particles per Minute depending on the System. Maaß, S. and Kraume, M.
CITplus – Das Sopat-System (Smart On-line Particle Analysis Technology) ist die Kombination einer photo-optischen Messtechnik und einer Bildverarbeitungs-Software. Diese analysiert im Gegensatz zu herkömmlichen inline-Sonden auch in hochkonzentrierten Dispersionen Größe und Konzentration von festen oder fluiden Partikeln in Echtzeit. Dies findet – anders als bei offline Methoden – direkt im Reaktor statt, wodurch erstmals eine Prozesssteuerung auf Basis der Partikelgröße möglich wird. Maaß, S., Paul, N. and Kraume, M.
The effect of the dispersed phase fraction on the evolving drop size distribution in different low viscous agitated liquid/liquid systems was investigated. The analysis focused on the drop breakage phenomena by hindering the coalescence completely. Therefore, polyvinyl alcohol concentrations were used around three times higher than the critical micelle concentration. The measured drop sizes were increasing with increasing dispersed phase fraction. As coalescence was completely hindered and also the measured dispersion viscosity showed no influence on the dispersed phase hold-up, the size increase is proposed to be a result of turbulence hindering. The influence of the dispersed phase fraction on the drop sizes in breakage dominated systems was well reproduced with population balance equation (PBE) simulations. The used breakage models require a turbulence damping factor (1+φd), which is used in most of the common models. Summarizing the various PBE simulations we can conclude that drop sizes in systems with different dispersed phase fractions can be easily predicted, if the model parameters are fitted to one set of experiments studying the same physical system. The change of the solvent was successfully simulated with outstanding results for two of the three further investigated organics. The used Weber correlations were also able to reproduce the linear interdependency between the drop size and the dispersed phase fraction. Unfortunately, every change in the dispersed phase needed new parameter estimation. As at least three out of four different liquid/liquid systems were predicted with excellent results, the PBE is proposed as a more robust tool which gives additionally information about the transient behavior of the system. Therefore, PBE should be used rather than the classical correlations widely used in academics and industries. An evaluation of several breakage rates from the literature based on single drop experiments was carried out. This data was collected in a single drop breakage cell under turbulent conditions, comparable to those in a stirred tank. For a constant initial diameter and flow velocity at least 750 single drops have been investigated to measure the breakage time and probability, using high-speed imaging. These results were used for the determination of breakage rates by the product of the inverse of breakage time and the breakage probability. The same subdivision was carried out for the literature models. These differentiations in the analysis showed that published models for the breakage probability are more or less similar and in good agreements with the experimental results. Proposed approaches for the breakage time are contrary. The experiments support the assumption of some researchers that the breakage time rise with increasing drop diameter. The magnitude of the predicted values of the breakage time for all kind of models is one or more magnitudes higher than experimental results in this study and from literature. Furthermore the influence of the physical properties, like viscosity or interfacial tension, is only poorly reflected in the available models. These analysis results lead to an improved breakage time model, which takes into account different breakage mechanisms and the influence of viscosity and interfacial tension. Combined with a breakage probability from literature, this new model leads to an excellent prediction of the breakage rate for the investigated single drops. Maaß, S., Buscher, S., Hermann, S. and Kraume, M.
Understanding of particle strain and drop breakage is relevant for various technical applications. To analyze it, single drop experiments in a breakage cell and evolving drop size distributions in an agitated system are studied. The mechanisms for particle strain and drop breakage are assumed to be comparable for the investigated turbulent flow regime. The agitation process is simulated using a population balance model. This model provides transient prediction capacities at different scales and can be used for scale-up/down projects. The number and the size distributions of daughter fragments for single drops have been studied. The results clearly support the assumption of binary breakage. The most common assumption of a Gaussian distribution for the daughter drop size distribution could not be supported. The evolution of a breakage-dominated toluene/water system was then simulated using different daughter drop size distributions from literature. The computational results were compared with experimental values. All simulations were able to predict the transient Sauter mean diameter excellently but varied strongly in the results on the shape of the distribution. In agreement with the experimental single drop results, the use of a bimodal or a very broad bell-shaped distribution of the daughter drops is proposed for the simulations. Although these results were obtained in a particular vessel for a specific phase system, it can be applied to simulate transient multiphase systems at different scales. We would expect that the general trends observed in this study are comparable to various applications in multiphase bioreactors. Maaß, S., Rehm, T. and Kraume, M.
Based on the successful predictions of transient drop sizes in the first part of this research (Maaß et al., Prediction of drop sizes for liquid–liquid systems in stirred slim reactors—part I: single stage impellers. Chem. Eng. J., 162 (2010) 792–801), this part is a straight continuation and extension of the earlier work. The predictive capabilities of the used population balance equation model are increased for single stage impellers and transferred to scale-up procedures of such applications. Therefore different scale-up rules for liquid–liquid systems are tested experimentally and by simulations in two different sized, geometrically similar vessels. The multi stage impellers are tested against comparable single stage impellers in terms of power consumption, mixing time and minimum impeller speed. Especially for high aspect ratios (larger than three), multi stage impellers successfully compete with the single stage ones. The measured drop size distributions in slim reactors with multi stage impellers showed no dependency on the local position, although the dispersion process is tedious due to the compartmentalization. The simulations are not able to reflect this initial phase of the dispersion process, but are in close agreement with the experiments after complete dispersion is fulfilled. Based on these experiences the aspect ratio is increased up to five and the resulting drop size can be predicted with reasonable deviations (lower than 10%). The results of the scale-up of this multi stage impeller liquid–liquid system do not lead to a clear conclusion. Although the simulations recommend the use of constant power input, the experiments could not support this. None of the other traditional scale-up rule are supported by the experiments. Overall, the results of power consumption, mixing time and dispersion behavior show the great potential of multi stage impellers for process optimization and intensification in slim reactors. Maaß, S., Wollny, S., Voigt, A. and Kraume, M.
An online measurement technique for drop size distribution in stirred tank reactors is needed but has not yet been developed. Different approaches and different techniques have been published as the new standard during the last decade. Three of them (focus beam reflectance measurement, two-dimensional optical reflectance measurement techniques and a fiber optical FBR sensor) are tested, and their results are compared with trustful image analysis results from an in situ microscope. The measurement of drop sizes in liquid/liquid distribution is a major challenge for all tested measurement probes, and none provides exact results for the tested system of pure toluene/water compared to an endoscope. Not only the size analysis but also the change of the size over time gives unreasonable results. The influence of the power input on the drop size distribution was the only reasonable observation in this study. The FBR sensor was not applicable at all to the used system. While all three probes are based on laser back scattering, the general question of the usability of this principle for measuring evolving drop size distributions in liquid/liquid system is asked. The exterior smooth surface of droplets in such systems is leading to strong errors in the measurement of the size of the drops. That leads to widely divergent results. A different measurement principle should be used for online measurements of drop size distributions than laser back scattering. Maaß, S., Metz, F., Rehm, T. and Kraume, M.
Although investigations in the field of stirred liquid/liquid dispersions have a long history, new questions are still emerging in dealing with the different aspects of industrial applications, such as suspension polymerizations. In this study the influence of physical parameters on drop size and power consumption, like liquid level, stirrer speed, stirrer height and baffle length, were experimentally analyzed. The results were used to determine modeling approaches which are capable of displaying the influence of the named parameters. It was shown that the energy law (dp ∼ ɛ−0.4; Shinnar, 1961 ) using the average energy dissipation only roughly predicts the Sauter mean diameter. The population balance equation (PBE) used with a one-zone modeling approach is slightly better in its prediction of results. Very satisfying predictions were obtained by using the PBE with a two-zone model. The overall deviations between calculated and predicted Sauter mean diameter was less than 10% using this approach. Only the successful prediction of the influence of the baffle length remained unattainable, even with the PBE two-zone model.